Young widow AJ Sinclair has persevered through much heartache. 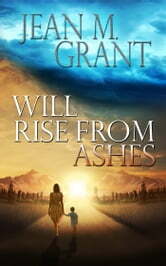 Has she met her match when the Yellowstone supervolcano erupts, leaving her separated from her youngest son and her brother? Tens of thousands are dead or missing in a swath of massive destruction. She and her nine-year-old autistic son, Will, embark on a risky road trip from Maine to the epicenter to find her family. She can't lose another loved one. Along the way, they meet Reid Gregory, who travels his own road to perdition looking for his sister. Drawn together by AJ's fear of driving and Reid's military and local expertise, their journey to Colorado is fraught with the chaotic aftermath of the eruption. AJ's anxiety and faith in humanity are put to the test as she heals her past, accepts her family's present, and embraces uncertainty as Will and Reid show her a world she had almost forgotten. As an avid reader and parent of a child with special needs, I thoroughly enjoyed this book and could not put it down. It's a fabulous fictional story, and it centers on a mother of a child with special needs and her journey, both physically and emotionally. It beautifully captures all the emotions, hopes, fears, and love that a parent has for a child with special needs. The author does an amazing job not only telling a wonderful and creative story but also accurately describing the challenges and rewards of families with a loved one on the autism spectrum. Highly recommend this book!